I make a pretty good pie. 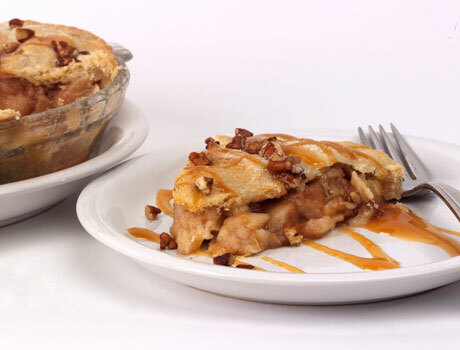 In fact, I pride myself on my pie crusts…homemade, tender, flaky…yummm. If I sound a bit smug, please allow me, because pie crusts are about the only cooking-related thing I’ve ever fully mastered. Besides, as we all know, making homemade pie crusts is no, well, piece of pie. Photographing pie isn’t easy either, which I learned this week in my studio photography class. Food photography, as a whole, is its own science because the food we photograph must be treated differently than the food we eat. Take my pie, for example. I make a great apple pie (have I mentioned this yet?) and my favorite baking apples are Cortland and McIntosh. Yet, for photography purposes, I should have made this pie with Red Delicious apples, even though they’re anything but delicious. Red Delicious are rock-hard even after baking, which means my pie would look more “piled high with apples” in the photograph and each slice of apple would maintain greater definition. Lesson learned: When it comes to food photography, what looks good may not always taste good. And visa versa. While researching for my photo shoot, I came across some interesting sites: The Kitchn has some great food photography tips, as does Still Life With, and Darren Rowse’s Digital Photography School. And for inspiration, check out Lara Feronni’s site. She’s a professional food photographer and her images are stunning.